QUESTION Is it advisable to buy an incubator when one is breeding on a small scale? ANSWER – An incubator is a desirable addition to the poultryman’s plant, whether he has many or few fowls. Machines of small capacity may be purchased cheaply and they are always ready for service. With them, eggs may be hatched at any season of the year; one does not have to depend upon sitting hens, and eggs hatched in an incubator do not produce chicks covered with lice as is the case when hatched by hens. QUESTION How soon will a healthy chick emerge from the shell after it is pipped? ANSWER – In six to ten hours. QUESTION Are home-made brooders successful? ANSWER – They are if they are properly constructed. One who is handy with tools and understands the principles of brooder construction can succeed in making a reliable brooder. QUESTION At what temperature should the brooder be kept during the first week that the chicks are in it? ANSWER – 90 degrees will be right for the first week. The brooder should, of course, have a nursery or runway much cooler than this where the chicks can scratch and exercise when they desire to do so. They will not need a temperature of 90 degrees continuously, but should have it to go to when wanted. The above questions and answers were taken from ‘A GUIDE TO SUCCESS WITH POULTRY – Over 900 Questions and Answers‘. 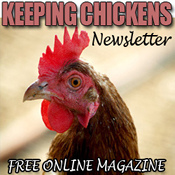 Free Online Magazine - Five Years of Back Issues in Members Area - Free chicken coop plans. You can unsubscribe at any time.